Enjoy this beautiful educational cartoon where Shawn The Train helps the car to learn about traffic signs. While learning about traffic signs the car will cross the railroad meeting Donald The Diesel Train, learn to pull over when a fire truck is coming, stop at the red light, stop when a school bus is loading or unloading and will try to learn how to drive safely when passing the construction site! Your child will see objects like traffic signs, traffic lights, railroad crossing signs, cars, trains, a fire truck, a school bus and construction trucks. Your child will love it! There are many signs through which Allah shows us that the zuhoor is close. Some of these signs may come true and some may not. These are 5 distinct signs, which absolutely must occur before the reappearance of Imam Mahdi (A). A discussion around the question that do FIFA's rules on prohibiting signs of religious identity on the pitch discriminate against Muslims? Following the horrific terrorist attack in Norway, we would like to look at how there is an emergence of the far right taking place in Europe which is not being taken seriously enough. There is a growing sense of unease in Norway that police failed to spot the warning signs which led to the horrific massacre of 98 innocent people. Now police forces across Europe and America are being asked to examine the threat posed by right-wing groups which have flourished in a recession-driven climate fuelled by Islamophobia. Thousands of supporters of Egypt\'s ousted president Mohamed Morsi take to the streets across the country. They have marked 100 days since the violent crackdown on pro-Morsi sit-ins in the capital Cairo. On another front, interim president Adly Mansour has signed into law an anti-protest bill. 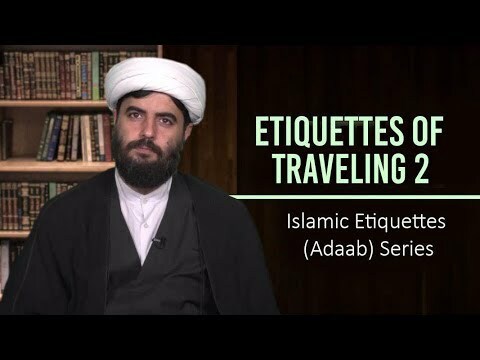 Etiquettes of Traveling 2 | Islamic Etiquettes (Adaab) Series This session: - Gaining lessons from the nations of the past - Acquiring knowledge and wisdom - Fufilling the needs of the Islamic society - Witnessing signs of Allah (rivers, jungles) - Recognizing and thanking the Creator Hujjatul Islam Haq Panah is a Howza teacher in Qom, Iran. دیدار شركت‌كنندگان در اجلاس جهانی جوانان و بیداری اسلامی با رهبر انقلاب http://farsi.khamenei.ir/news-content?id=18862 صدها نفر از جوانان 73 كشور جهان از جمله جوانان مصر، تونس، لیبی، لبنان، یمن، بحرین و فلسطین صبح روز 10 بهمن 1390، در فضایی صمیمانه و لبریز احساسات اسلامی و انقلابی، با رهبر معظم انقلاب اسلامی دیدار كردند. در این دیدار پس از سخنان نمایندگان جوانان تونس، مصر، یمن، بحرین، فلسطین، لیبی و لبنان، حضرت آیت الله خامنه‌ای در سخنانی، جوانان كشورهای اسلامی را حاملان بشارت‌های بزرگ برای آینده امت اسلامی خواندند و افزودند: بیداری جوانان سرتاسر جهان اسلام، امید به بیداری عمومی ملتهای مسلمان را افزایش داده است. رهبر انقلاب، تاریخ بشر را بر سر یك پیچ بزرگ تاریخی و در آستانه تحولی عظیم برشمردند و تأكید كردند: بشریت از همه مكاتب و ایدئولوژی‌های مادی اعم از ماركسیسم، لیبرال دمكراسی و ناسیونالیسم سكولار عبور كرده و در آغاز دوران جدیدی است كه بزرگترین نشانه آن، توجه ملت‌ها به خدای متعال، استمداد آنها از قدرت لایزال الهی و اتكای ملتها به وحی است. ایشان با اشاره به تسلط شبكه دیكتاتوری پیچیده، خطرناك، فاسد و شیطانی صهیونیست‌ها و قدرت‌های استكباری بر جهان افزودند: قیام ملت‌های منطقه علیه دیكتاتورهای وابسته، جزئی از مبارزه بشریت با دیكتاتوری جهانی صهیونیست‌هاست و جامعه بشری با پشت سر گذاشتن پیچ بزرگ تاریخی، از سیطره این دیكتاتوری خطرناك رها می‌شود و این تحول عظیم براساس وعده صادق پروردگار، به آزادی ملت‌ها و حاكمیت ارزش‌های معنوی و الهی منجر خواهد شد. حضرت آیت الله خامنه‌ای با اشاره به كسانی كه ممكن است پیروزی بر شبكه دیكتاتوری جهانی صهیونیست‌ها را غیرممكن بدانند خاطرنشان كردند: قبلاً نیز اگر كسی از پیروزی جوانان مؤمن حزب الله بر ارتش رژیم صهیونیستی سخن می‌گفت و یا از ذلت طاغوت مصر و تحولات عجیب شمال افریقا حرف می زد خیلی‌ها باور نمی‌كردند همچنانكه استقامت، پیروزی و پیشرفت جمهوری اسلامی نیز برای برخی ها قابل باور نبود اما قدرت فائقه پروردگار، خود را در این پیروزی‌ها و تحولات شگفت نشان داد. رهبر انقلاب اسلامی، حضور هوشیارانه و استقامت ملت‌ها در میدان را زمینه‌ساز تحقق بدون تردید نصرت‌های الهی خواندند و افزودند: در پرتو تحقق وعده‌های پروردگار، صهیونیست‌ها، شیطان بزرگ امریكا و قدرت‌های غربی امروز در مقابل بیداری اسلامی احساس ناتوانی می‌كنند و این احساس ضعف و شكست هر روز بیشتر خواهد شد. حضرت آیت الله خامنه‌ای، تحولات كشورهای اسلامی را آغاز راه نجات و سعادت، برشمردند و افزودند: مهم این است كه پیروزی‌های بدست آمده را پایان راه ندانیم و با ادامه مجاهدت و تكیه بر عزم و اراده ملت‌ها، و اتكا و حسن ظن به خدای قادر متعال، مبارزه با زورگویان جهانی و عوامل آنها را ادامه دهیم. http://english.khamenei.ir//index.php?option=com_content&task=view&id=1580&Itemid=16 In the Name of Allah, the Beneficent, the Merciful All praise belongs to Allah, the Lord of the Two Worlds, and peace and greetings be upon the Master of Messengers, the Master of all people, our Master and Prophet, Ab-al-Qassem Al-Mustafa Muhammad, and upon his immaculate household and chosen companions and upon those who follow him well until the Day of Judgment. I would like to welcome all the dear guests, the honorable youth, the bearers of great news for the future of the Islamic Ummah. Each and every one of you is a bearer of a great piece of news. When the youth of a country awaken, there will be increased hope of a general awakening in that country. Today Muslim youth have awakened throughout the world of Islam. So many traps have been set in the way of proud and determined Muslim youth, but they have managed to eliminate these problems. You see what has happened in Tunisia, in Egypt, in Libya, in Yemen and in Bahrain. You see the movement that has taken place in other Islamic countries. This is all good news. You dear youth should know that the history of the world and the history of humanity is at a great momentous juncture today. A new era is starting throughout the world. The great and clear sign of it is the attention to Allah the Exalted, the cries for assistance from the inexhaustible source of divine power and reliance on divine revelations. Humanity has passed through the days of materialistic ideologies and schools and thought. Today neither Marxism, nor western liberal democracy, nor secular nationalism has any appeal. You see what is going on in the cradle of western liberal democracy - in America, in Europe. They admit failure. Today among members of the Islamic Ummah, the greatest appeal belongs to Islam, the Holy Quran and the school of thought that is based on divine revelation. Allah the Exalted has promised that the divine and Islamic school of thought and the school of thought that is based on divine revelation can help humanity achieve happiness. This is a very sacred, very important and very significant phenomenon. Today Islamic countries have risen up against dependent dictatorships. This is a prelude to an uprising against global and international dictatorship, namely the tyranny of the corrupt and evil network of the Zionists and the arrogant powers. Today international autocracy and dictatorship is embodied by the tyranny of America, America\'s followers and the satanic and dangerous Zionist network. Today they are acting like a dictator throughout the world by using different methods and different means. What you did in Egypt, what you did in Tunisia, what you did in Libya, what you are doing in Yemen, what you are doing in Bahrain - and strong motivation has built up in other countries to do the same - is part of a battle against this dangerous and harmful dictatorship that has been pressuring humanity for two centuries. The momentous juncture that I spoke about is the transition from the hegemony of this dictatorship to national freedom and the rule of spiritual and divine values. This will happen: do not consider discount it. This is a divine promise: \"And surely Allah will help him who helps His cause.\" [The Holy Quran, 22: 40] Allah the Exalted stresses that if you help His cause, He will assist you. This might look unlikely from a materialistic perspective, a perspective that is based on material calculations. However, there were many things which used to look unlikely, yet they happened. Around fifteen months ago, would you have thought the Egyptian taghut would be humiliated and annihilated like that? At that time, if people had been told that Mubarak\'s corrupt and dependent regime would be overthrown, many of them would have rejected the claim as unlikely, but it happened. Two years ago, if somebody had claimed that those amazing events would happen in North Africa, the majority of the people would have rejected it. If somebody had claimed that in a country like Lebanon, a group of faithful youth would manage to defeat the well-equipped Zionist army, nobody would have believed him. But these things happened. If somebody had said that the Islamic Republic would manage to resist for 32 years and achieve more power and progress on a daily basis in spite of all the enmity by the east and the west, nobody would have believed him, but it happened. \"Allah promised you many acquisitions which you will take, then He hastened on this one for you and held back the hands of men from you, and that it may be a sign for the believers and that He may guide you on a right path.\" [The Holy Quran, 48: 20] These victories are divine signs. They are signs of God\'s overwhelming power. Whenever the people step into the arena, whenever we enter the arena with all our heart and soul, there will definitely be divine assistance. Allah the Exalted shows us the path: \"And (as for) those who strive hard for Us, We will most certainly guide them in Our ways.\" [The Holy Quran, 29: 69] God will guide and assist. He will help people achieve their goals. The condition is that we should be present in the arena. What has happened so far is very significant. For two hundred years, westerners ruled the Islamic Ummah by making use of their scientific advances. They occupied Islamic countries: some of them directly, some of them indirectly with the help of local dictatorships. England, France and finally America - which is the Great Satan - spread their hegemony over the Islamic Ummah. They humiliated the Islamic Ummah as much as they could. They planted the cancerous tumor of Zionism at the heart of the strategic Middle East region and they strengthened it in every way. They were sure that their interests and policies had been safeguarded in this critical part of the world. But the Islamic resolve of Muslim people and their presence wiped out all these impossible dreams and put an end to all these goals. Today the arrogant powers of the world feel helpless in the face of Islamic Awakening. You are dominant. You will win. The future belongs to you. What has been done is a great achievement. But the important point is that this is not the end. This is only the beginning. Muslim nations must continue their struggle so that they can eliminate the enemy in different arenas. The battle is a battle of wills. Any side whose will is stronger has the upper hand. A person whose heart depends on Allah the Exalted has the upper hand. \"If Allah assists you, then there is none that can overcome you.\" [The Holy Quran, 3: 160] If you get divine assistance, nobody will overpower you and you will move forward. We want Muslim nations that make up the great Islamic Ummah to be free. We want them to be independent. We want them to be honorable. We want them to avoid humiliation. We want them to organize their life with the lofty and progressive rules of Islam. And Islam can help them to do so. They kept us scientifically backward for many years. They trampled on our culture. They destroyed our independence. Today we have awakened and we will conquer the arenas of science one after the other. Thirty years ago, when the Islamic Republic was established, the enemies used to say that although the Islamic Revolution had achieved victory, it would not be able to manage different areas of life. They used to say that the Islamic Revolution would back down. Thanks to Islam, today our youth have managed to make great achievements in scientific areas, achievement that would not have occurred to the enemies themselves in the past. Thanks to reliance on Allah the Exalted, today Iranian youth achieve great scientific accomplishments. They produce enriched uranium. They produce stem cells. They make great advances in biotechnology. They venture into space. And all of these things are due to reliance on Allah the Exalted and the slogan of \"Allahu Akbar\". [Audience shout \"Allahu Akbar\"] We must not underestimate our own capabilities. Among the biggest problems that western culture has imposed on Islamic countries is two wrong and misguided conceptions. First, they instilled a sense of incompetence into Muslim nations. They made Muslim nations believe that they were not capable of doing anything - neither in the political arena, nor in the economic arena, nor in the scientific arena. They told Muslim nations, \"You are weak.\" We Muslim nations suffered from this misconception for decades and we stayed backward. The second misconception that they instilled into our mind was that our enemies were invincible and that their power was overwhelming. They convinced us that America could not be defeated, that it was impossible to force the west to retreat, that we had to tolerate them. Today it has become clear to Muslim nations that both of these conceptions are completely wrong. Muslim nations can move forward. They can restore their Islamic glory - Muslims used to be at the peak of honor, at the peak of scientific, political and social brilliance. And the enemy has to retreat in different arenas. This century is the century of Islam. This century is the century of spirituality. Islam offers rationality, spirituality and justice to nations. The kind of Islam that is based on rationality, Islam that is based on thinking, Islam that is based on spirituality, Islam that is based on attention to God and reliance on Him, Islam that is based on jihad, Islam that is based on hard work, Islam that is based on action - these are divine and Islamic teachings for us. Today the important point is that the enemy is designing plots to compensate for the blows he has received in Egypt, Tunisia and other regional countries. We must pay attention to the machinations of the enemy. We must take care not to let them hijack popular revolutions from the people. We must take care not to let them derail these revolutions. Make use of the experiences of others. The enemy does many things in order to derail popular revolutions and neutralize popular movements. The enemy does many things in order to counteract selfless efforts and the blood that has been shed. It is necessary to be careful. It is necessary to be vigilant. You dear youth are the driving force behind these movements. Be vigilant. Be careful. We have gained a lot of experience over the past 32 years. It is 32 years that we have been countering hostilities. We have resisted and overpowered the enemy. [Audience shout \"Allahu Akbar\" and pledge allegiance to the Supreme Leader] The west and America have never refused to hatch plots against the Islamic Republic. If there was something they did not do, it was because they could not do it. They did whatever they could and they have been kicked in the mouth and defeated at every stage. [Audience shout \"death to America\"] The same thing will happen in the future as well. The Islamic Republic will continue foiling all their plots in the future as well. This is something that God has promised us and we do not have any doubts in this regard. We do not doubt the truthfulness of God\'s promise. We do not doubt Allah the Exalted. Allah the Exalted admonishes those who doubt Him. \"And (that) He may punish the hypocritical men and the hypocritical women, and the polytheistic men and the polytheistic women, the entertainers of evil thoughts about Allah. On them is the evil turn, and Allah is wroth with them and has cursed them and prepared hell for them, and evil is the resort.\" [The Holy Quran, 48: 6] God\'s promise is truthful. The Iranian nation has brought all its facilities into the arena and because we are in the battlefield, God will definitely assist us and the same is true of all other countries as well. But we must be vigilant. All of us must be vigilant. All of us must watch out for the machinations designed by the enemies. The enemy tries to counteract our movements and to foment discord. Today the Islamic movement throughout the world of Islam is independent of Shia and Sunni. It is independent of Shafi\'i, Hanafi, Ja\'fari, Maliki, Hanbali and Zeidi schools. It is independent of Arabs, Persians and other ethnicities. Everybody is present in this vast arena. We must try not to let the enemy foment discord among us. There must be a sense of brotherhood among us. We must try to specify our goal. The goal is Islam. The goal is Quranic and Islamic rule. Of course, there are certain differences and similarities among Muslim countries. There is no single paradigm that fits all Islamic countries. In different countries, there are different geographic, historical and social conditions, but there are also certain shared principles: all of us are opposed to the arrogant powers, all of us are opposed to the evil hegemony of the west, all of us are opposed to the cancerous tumor, Israel. [Audience shout \"death to Israel] Wherever it is felt that something is being done which would benefit Israel and America, we must be vigilant. We must know that it is a foreign move. We must know that it is not an insider move. Wherever there is an Islamic, anti-Zionist, anti-arrogance, anti-tyranny and anti-corruption move, that move would be a correct move and all of us would be insiders. Then it would not matter whether we are Shia or Sunni, or whether we are from this or that country. All of us must think in the same way. As an obvious example, notice that today all media companies of the world are trying to isolate the people of Bahrain and their movement. What is the reason? The reason is that the issue is a Shia-Sunni issue: they want to foment discord. They want to draw lines and separate Muslims. There is no difference between pious Muslims who have a tendency towards this or that Islamic denomination. Islam is the aspect that all of these denominations have in common. Unity of Islamic Ummah is the aspect that all of them have in common. [Audience shout \"Allahu Akbar\" and \"unity, Islamic unity\"] The secret behind victory and the continuation of the movement is reliance on God, trust in Him and maintaining unity and cohesion. My dear children, take care not to let the enemy stop your movement. In two different parts of the Holy Quran, Allah the Exalted tells His Messenger to be steadfast. \"Then stand firm in the right way as you are commanded.\" [The Holy Quran, 11: 112] \"And stand firm in the right way as you are commanded.\" [The Holy Quran, 42: 15] God tells the Holy Prophet (s.w.a.) to be steadfast. Being steadfast means continuing one\'s path in a determined way without stopping. This is the secret behind success. We must move forward. This movement is a successful movement because the prospects are bright. The future prospects are bright. By Allah\'s favor, there will be a day when the Islamic Ummah will reach the peak of power and independence. [Audience shout \"humiliation is far from us\"] While preserving their characteristics and differences, Muslim nations should come together under the banner of the call to God and the call to Islam. Then the Islamic Ummah will regain its dignity. We have natural resources in Muslim countries. We have strategic regions. We have numerous natural resources. We have outstanding figures. We have highly skilled and talented manpower. We must make efforts and Allah the Exalted will bless our efforts. I would tell you dear youth that the future belongs to you. By Allah\'s favor, you dear youth will see that day and you will hand down your sources of pride to the future generations. Greetings be upon you and Allah\'s mercy and blessings. Egypt’s Muslim Brotherhood says its candidate Mohamed Morsi will face former Prime Minister Ahmed Shafiq in the country’s presidential run-off election. Morsi is in the lead with 25.3 percent of the vote, followed by Shafiq with 24.9 percent. Official results from the electoral body are expected to be announced on Tuesday. The two candidates will compete in a run-off election on June 16 and 17. Electoral commission officials said that turnout was around 43 percent over the two days of voting on Wednesday and Thursday. Press TV has conducted an interview with Yahia Ghanem, editor at the al-Ahram newspaper, to hear his opinion on this issue. The following is a rough transcription of the interview. Press TV: Trying to understand these results specially Shafiq he did not do that well in his campaigning. How did he come up to this second place, finish at this point which is not really finished, it is unofficial results, what is your reaction to that? Ghanem: Well if you talk, if you ask about the reactions I believe that partly it was a shock for a lot of number of the Egyptians whereas it was a pleasant surprise of course for some others. So I believe that as much as Egypt and the Egyptians have been showing strong signs of being united, a united house in their march towards democracy, when it comes to the results of the first round of the elections they started showing strong signs of a house divided in terms of this splinter between Shafiq which is considered to be a remnant of the former regime and Dr. [Morsi], the candidate of the Muslim Brotherhood. Press TV: In terms of who came out to vote we are looking at two large majorities, 60 percent saying to be from the urban areas which are farmers and then of course we are looking at the percentage of the youth in the country which is said to be 50 percent below the age of 30. But it does not seem like these results are indicating that which some are saying the silent majority came out. Do you see it that way? Ghanem: Say it again please. Press TV: The silent majority, do you think they were the ones that came out, tilting some of the voting in terms of the results we are seeing right now? Ghanem: I am not quite sure if I understood your question... Press TV: The silent majority of Egyptians is what I am getting at, did they come out, the ones who did not come out to vote for the parliamentary elections maybe came out this time to vote? Ghanem: Well, I believe that there was a large percentage of absence from the voters because everybody expected actually a higher percentage, everybody expected that the Egyptians would break the record that they scored during the first stage of the last parliamentary elections but unfortunately it did not happen. And I believe that there are reasons behind such absence and such reluctance of that large number of voters to practice and to exercise the right in voting the first civilian elected president but I believe that a large number of the youth who actually participated and spot the revolution, also they were reluctant to participate in these elections and I observed that while I was touring the polling stations, I believe that there were reasons actually behind such reluctance, such as the way the military council ran the whole show during the last 16 months and specially running that presidential election show. Press TV: And of course one of the biggest troubles and challenges Yahia Ghanem is the constitution and the presidential powers. When is that going to be resolved? Ghanem: I believe we still have to go for quite a while after the elections to sort out this issue of the right in constitution and specially that issue of writing the constitution. But personally speaking I believe that this issue have been made an issue by certain parties with interest to complicate things in Egypt because writing constitution is not that problem actually and they complicated the whole thing by inciting all different kinds of society, all the [structure] in society to claim the right of being represented in this committee and to share or to take part in writing the constitution. No constitutions in the world are being written that way. It is up to the specialists, the lawmakers or the professors of constitutional law to write the constitution as in many or in all the countries in the world and then for the establishing committee to discuss and to review that draft constitution but of course it does not make any sense for all representatives of all the sectors of the society and the [structure] of the society to take part in writing the constitution. It is funny and it is not true of course. Thousands of Israelis have taken to streets to protest against the austerity measures imposed by the regime. The demonstrations were held in Tel Aviv, East al-Quds (Jerusalem), and Be\\\\\\\'er Sheva in southern Israel on Saturday evening. Similar protests were also held in front of Israeli Prime Minister Benjamin Netanyahu\\\\\\\'s house in Caesarea where the demonstrators carried signs reading, \\\\\\\"Instead of giving to the poor, they give to the rich, what a corrupt government.\\\\\\\" In Tel Aviv, the protesters held signs reading, \\\\\\\"It\\\\\\\'s time to tax the rich,\\\\\\\" and \\\\\\\"It\\\\\\\'s enough.\\\\\\\"
Introducing our new cartoon series - Real City Heroes (RCH)! RCH is all about our city heroes - policemen, firemen, ambulance crew and even a garbage truck. In this cartoon you will meet George the Garbage Truck who will take you around the city to collect garbage. Later he will talk to you about the importance of recycling.